So much news on climate change and the COP24 meeting in Poland. David Attenborough was all over the news for his comments on the urgency of making progress. Previously neutral, he is increasingly speaking out on the dangers to our planet, perhaps because he knows it more intimately than most and has noticed the changes first hand through his long career. In other climate news, an explainer on the history of the COP meetings and what to expect; the BBC presents seven charts and outlines what you can do to help; and the Trump effect is acknowledged as a serious problem. In business, the economics of fighting climate change and of valuing the environment; and why slavery is so hard to avoid in the products we buy. Also, a very emotional story of the plight of the Sumatran tiger and their forests being destroyed for palm oil and rubber plantations. The choices you make matter. The naturalist Sir David Attenborough has said climate change is humanity’s greatest threat in thousands of years. The broadcaster said it could lead to the collapse of civilisations and the extinction of “much of the natural world”. He was speaking at the opening ceremony of United Nations-sponsored climate talks in Katowice, Poland. The UN has warned the 2015 Paris accord’s goal of limiting global warming to “well below 2C above pre-industrial levels” is in danger because major economies, including the US and the EU, are falling short of their pledges. But scientists at the Intergovernmental Panel on Climate Change (IPCC) – the leading international body on global warming – last month argued the 2C Paris pledge didn’t go far enough. The global average temperature rise actually needed to be kept below 1.5C, they said. So how warm has the world got and what can we do about it? UN climate talks this fortnight could determine whether a post-Trump US president would rejoin the Paris Agreement, according to two former top Obama officials. At discussions in Katowice, Poland, almost 200 countries will try to agree the Paris Agreement ‘rulebook’. That should lay out how countries will enact the accord, for example how they report their efforts to fight climate change. But as talks began on Sunday, thousands of points of disagreement remained. President Donald Trump’s words and actions are restricting global efforts to cut carbon, according to a new study. The analysis says the US’ withdrawal from the Paris climate agreement has created the political cover for others to go slow on their commitments. The author says the world is in denial about President Trump’s true impact. The number of people dying from heatwaves is likely to rise sharply in some regions by 2080 if policymakers fail to take mitigating steps in climate and health policies, according to the results of a study on Tuesday. Deaths caused by heatwaves could increase dramatically in tropical and subtropical regions, the study found, followed closely by Australia, Europe and the United States. Published in the journal PLOS Medicine, the study’s results suggest stricter mitigation policies should be applied to reduce greenhouse gas emissions, because lower greenhouse gas emissions are linked with fewer deaths due to heatwaves. We have just 12 years left to reduce emissions and achieve the Paris Agreement’s highest ambition of limiting warming to 1.5°C. We have been warned, repeatedly, of the high stakes of our present climate gamble. If we continue on our current course, radical solutions are going to be needed sooner rather than later. Champions of solar radiation management (SRM) say this is the answer we’ve been looking for. SRM techniques cool the planet by reflecting sunlight away from it. AUSTRALIA – There are concerns a national park famous for its waterfalls and luscious greenery may take hundreds of years to recover from the Queensland bushfire disaster. 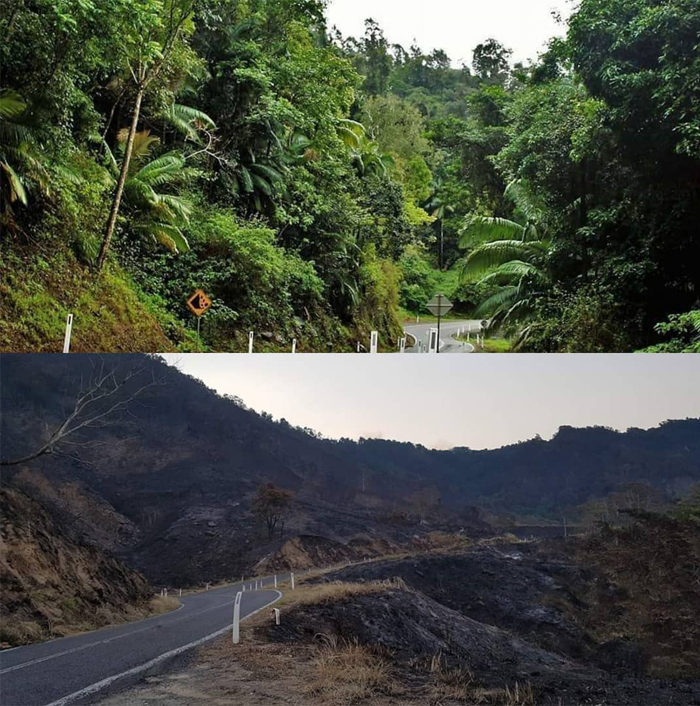 Eungella National Park, 90 kilometres west of Mackay, was damaged by a blaze over the weekend, causing 110,000 hectares of the national park and surrounds to be blackened. Parts of the green subtropical rainforest have literally been reduced to cinders. INDONESIA – With fewer than 400 Sumatran tigers left in the wild, the recent death of a pregnant tiger and two unborn cubs in a poacher’s snare was particularly devastating. Villagers in a remote area of Sumatra’s Riau province heard the animal wailing and called for help. The tiger managed to escape the trap, but every effort she made to shake off the metal wire only led to it cutting more tightly into her abdomen. She died before rangers arrived. The tiger was only days from giving birth, but even so, her male and female cubs could not be saved. Ethan, what a question. To be truthful, we’re not sure what was before the Big Bang. The whole idea of “before” is not as simple as it sounds – as we’ll soon discover. But before we get into a total head spin of answering your great question, let’s step all the way back to the beginning of our Universe nearly 14 billion years ago. The World Bank is to make about $200bn (£157bn) available to fund action on climate change from 2021-25, helping countries adapt to the effects of warming and reduce greenhouse gas emissions. The sum represents a doubling of the five-year investment plan put in place after the landmark Paris agreement of 2015. UK and US insurers are lagging far behind European firms when it comes to divesting from coal-heavy businesses and refusing to insure them, campaigners have warned. At least 19 major insurers holding more than $6tn in assets – a fifth of the industry’s global assets – have now divested from coal, according to a report from the Unfriend Coal campaign, which represents a coalition of a dozen environmental groups including Greenpeace, 350.org and the Sierra Club. An open letter, sent today by the Forum’s Alliance of CEO Climate Leaders, is significant for two reasons. Firstly, with 50 global CEOs running organizations with a combined annual revenue of more than $1.5 trillion (that’s roughly the equivalent to the GDP of Australia or Spain) calling on governments to step up efforts to fight against climate change, it’s a welcome reminder that powerful forces stand ready to help keep the Paris Agreement alive. Secondly, coming as it does before climate leaders meet in Katowice, Poland at COP24, it provides us with a timely opportunity to assess the business community’s role to date in helping meet its ambitious goals. Lehman Brothers filed for bankruptcy on September 15, 2008. The investment bank’s collapse was the drop that made the bucket of global finance overflow, starting a decade of foreclosures, bailouts and austerity… Ten years later, private finance and large investors will play a central role at the COP24 in Katowice, Poland, and in the full implementation of the 2015 Paris Agreement. Representatives from pension funds, insurance funds, asset managers and large banks will attend the meeting and lobby governments, cities and other banks to favour investments in infrastructure, energy production, agriculture and the transition towards a low-carbon economy. Former President George H.W. Bush, who died on Nov. 30, was admirable for many reasons, from his skillful leadership through the end of the Cold War to his personal warmth and courtesy. As an environmental economist, I believe his approach to conservation also deserves attention…. George H.W. Bush, who pledged to be ‘the environmental president,’ took a market-based approach to pollution control that helped clear the air. Now some experts think it could work on climate change. Over the last decade, an industry has developed that values different aspects of nature in different ways. Its growth has been underpinned by the argument that, in a neoliberal world where the market is the dominant mechanism for distributing scarce resources, those assets that cannot be priced and traded are either undervalued or overlooked. Putting a price on nature allows it to be included in the market calculus and, thereby, to be noticed. It is also argued that the discipline involved in doing this contributes to more rational and therefore better decisions involving nature. It seems new action to tackle plastic pollution is announced every week, from the 5p plastic bag charge to governments debating a tax on plastic packaging. Businesses are also showing their green credentials as major supermarkets pledge to reduce plastic packaging alongside some multinational companies. With such serious steps, it looks like our problem with plastic will soon be fixed. Before we get too excited though, other recent news stories include billions of dollars being invested in new plastics refineries and plastics being found everywhere, including in our soil. AUSTRALIA – If you care about battery storage and distributed energy in Australia, you’re probably aware that a number of battery incentive programs are now available through various state & territory governments (not counting the federal Labor party’s election promise). Interestingly, they are being delivered by governments from both of the major political parties – a fair indication of which way the winds are blowing longer-term. We’ve put this list as a stocktake of which governments are now offering programs to bolster uptake of home battery storage. AUSTRALIA – Indian mining multinational Adani has announced that it will self-fund a significantly smaller coal mine in the Galilee Basin, after failing to secure finance from more than 30 domestic and international banks and lenders. Federal Resources Minister Matt Canavan has described Adani as a “little Aussie battler” and praised the newly scaled-down project’s purported regional economic benefits. NEW ZEALAND – Ports of Auckland plans to build the city’s first hydrogen fuel production plant on its waterfront land over the next year. The carbon-free fuel it produces will initially be used for hydrogen-powered forklifts and cars, and possibly a bus to be trialled on Auckland routes. The project partners are Auckland Council, Auckland Transport, and KiwiRail, which is watching global trials of hydrogen-powered trains. NEW ZEALAND – New Zealand farmers have to operate at a higher level than they have in the past if they wish to retain their social licence to farm, Agriculture Minister Damien O’Connor​ says. The higher standards around water quality and the public expectations around ethical labour and animal welfare practices are realities farmers have to accept, he told farmers during a panel discussion at the Effluent Expo held at Mystery Creek.